Boys in our Books welcomes Edmond Manning and the “King John” blog tour! This is the tale of La Contessa, the finest pirate ship ever to sail the Nevada desert. She first graced Burning Man in 2002, the same year King John takes place (Shameless book plug. It’s over. Let’s move on with the tale.) Despite being crafted as a replica of a Spanish galleon, and quite faithful to the original design of those ships, some significant structural changes were made. Like, for example, it was not designed for water. No, it rode atop a long, yellow school bus. Many mutant art cars that year were water-themed to match Burning Man’s theme: The Floating World. La Contessa was the immediate favorite, speeding around the desert hunting a great white whale that spat fire from its blowhole. They liked to chase the whale, careening wildly, crowds chasing and begging for a lift. The crew partied up top, the most enviable club in the desert that year. The sponsors were a popular San Francisco group called the Extra Action Marching Band. They are artists. They really are a marching band. With help from some experts, they built a real pirate ship. C’mon. That’s pretty damn cool. Like many who attend Burning Man, the creators were smarter than average. The real world as it exists today does not challenge them enough, so they hooked up with the like-minded folks who founded Burning Man, a place where impossible wonders are worth creating again. Why? Because we’re beautiful and we’re capable. The best two qualities that we—as a species—have going for us. As the tale was told to me on blooooaarrrrrrgs, mateys, online blarrrrrgs, navigating La Contessa in the desert was challenging. One blogger explained his firsthand experience, describing how the pilot used a narrow periscope to see out in front of the ship, and the range of vision was tiny, so more often, they relied more on a series of relays, yelling from the top to the bus driver, which only worked well if you could see the crash coming 200 feet away and you were traveling five miles per hour, the speed mutant art cars are not supposed to exceed. In the hands of her mischievous creators, La Contessa liked speed. She and her crew got in trouble regularly with Burning Man’s Department of Mutant Vehicles, and in 2004 received the ultimate DMV punishment: the air drained from their tires, grounding their vehicle for the rest of the event. But they apparently had a duplicate set of bus keys and some means to inflate their tires, because The Extra Action Marching Band stole the ship and once again, the wild pirates of La Contessa sailed the star-spangled night, drinking cheap beer, howling into the vastness of space, yelling for life. They could have killed somebody. That’s the problem in situations like this. Yay to them for creating something magnificent. Of course you want to sail her at top speeds. And…those of us who don’t wish to be crushed by a drunken sailor doing cake vodka shots while manning a school bus with a pirate ship as a hat, well, we are not cool with the speed. Not cool. By 2005, there was question whether she would ever sail again. Still a wild favorite of burners every year, the crew had used up all their chances with the DMV. La Contessa was not welcome at Burning Man. The ship’s future careened into uncharted waters, unable to return, but what way was forward? It’s not like anyone could store a pirate ship in their San Francisco garage. 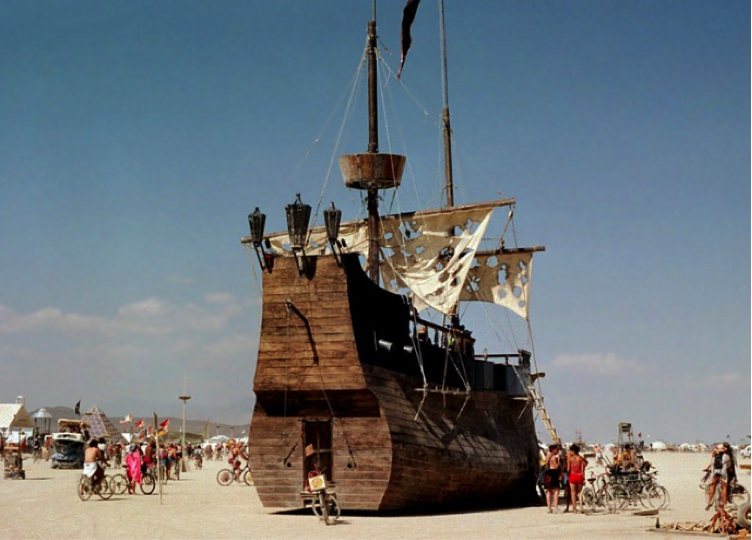 They signed a contract to store the ship on property near Burning Man. They would figure out what to do with her later. The leader of the La Contessa project promised to search for permanent housing. In 2006, thieves broke into La Contessa and—deep within her hold—found the figurehead that proudly rode the ship’s bow. The sculpture was a figure of a woman by San Francisco sculptor Monica Maduro. The Marching Band owners kept news of the theft private, hoping to smoke out the thieves hiding within in their burner community. Later, a picture of the stolen figurehead allegedly appeared in a photo on tribe.net, where burners chat. Someone bragged about the newest addition to the living room. The picture was quickly removed and the figurehead’s presence in the city of fog grew to legendary status. Where is she today? Nobody knows. This clause in her contract was a blessing to artists with big pieces, or constructions hard to disassemble. La Contessa washed ashore on her sandy lawn. But months later, her house burned down, forcing her to move. Of course, this meant she could no longer reasonably “see” the pieces in her front yard. On December 5, 2006, the property owner burned La Contessa to the ground. Police called it third degree arson, but his lawyer argued that the land owner tried to contact the ship’s owner and was unsuccessful. With the ship seemingly abandoned, and no way to get ahold of the owners, he felt there was no reason he could not remove what was on his property. Of course, the Extra Action Marching Band claimed arson and demanded one million dollars restitution in a 2012 lawsuit. They lost and had to pay the Michael Stewart’s legal fees. La Contessa is a fascinating story, but even more interesting to me are the group dynamics behind this ship and its relationship to Burning Man. Burning Man attempts to create a new way of living. Radical acceptance. Radical self-reliance. They have ten principles that are pretty solid ways of being in the world. You don’t have to agree with all ten to appreciate the best intentions behind this endeavor. We might all need a new way of being in the world. A world where civic responsibility doesn’t feel like a burden, it feels like a blessing. A world where we take care of ourselves and quit demanding other people serve us like emotional waiters. At the same time, Burning Man culture is pretty much a teenager, clashing and evolving, figuring out how to keep their original values while growing into a full-fledged bureaucracy. Will they survive these furious teenage years? Will they emerge as another top-heavy, rule-oriented force in the world, or will they find a way to navigate so we all share in the power? So we all get to play in a variety of unique ways. Radical acceptance. Communal effort. Radical self-expression. Leave no trace. They might be onto something. 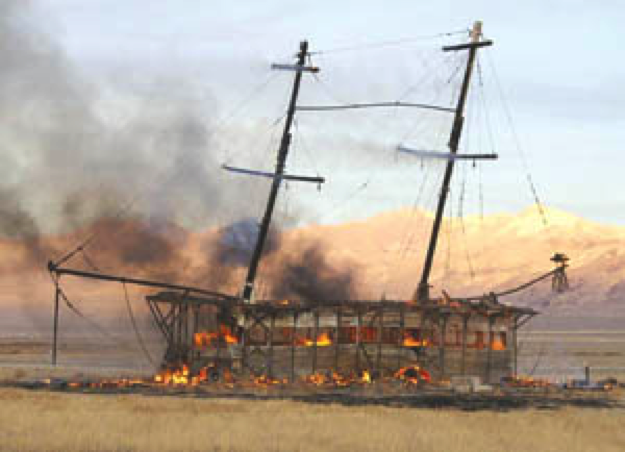 Anything is possible in a world where a replica Spanish pirate ship gets fined for partying too hard on the most barren, wind-whipped desert imaginable. I loved this mini history lesson into something I really didn’t know. Thanks for a great post. It’s crazy, isn’t it–all the strange tales out there about lives and topics we’ve never heard of. Thanks for reading! I hope you like it. Actually…if you didn’t read any of the other books and you win, I’d be glad to substitute the FIRST book in the series for this one. Your call. You’re welcome! I love talking about LaContessa! This is such an interesting tour! Learning something at each stop! I’m so delighted you’re on the blog tour. I wanted each one to be interesting and fun–I love the La Contessa blog. The history of this ship (and what became of it) is enough for its own short story or novel, I swear. Congratulations to juliesmall1959, winner of the drawing for an eBook copy of King John! This entry was posted on September 23, 2015 by BioB in Blog Tour, Giveaway, Guest Post and tagged Edmond Manning, giveaway.